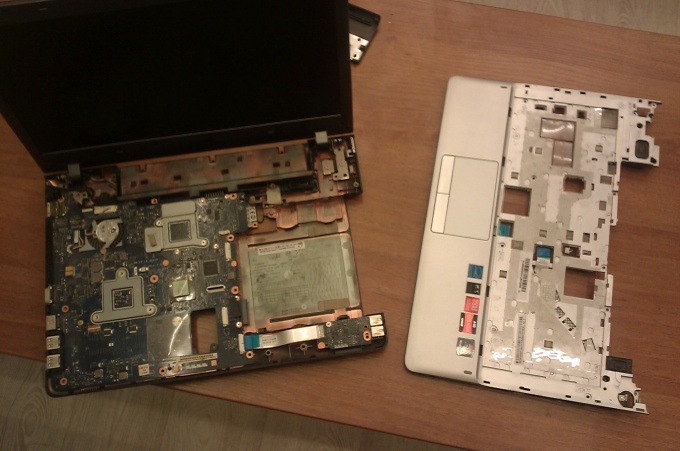 Sometimes there is a need to disassemble the laptop. To do this properly, you need to thoroughly understand the intricacies of the process. 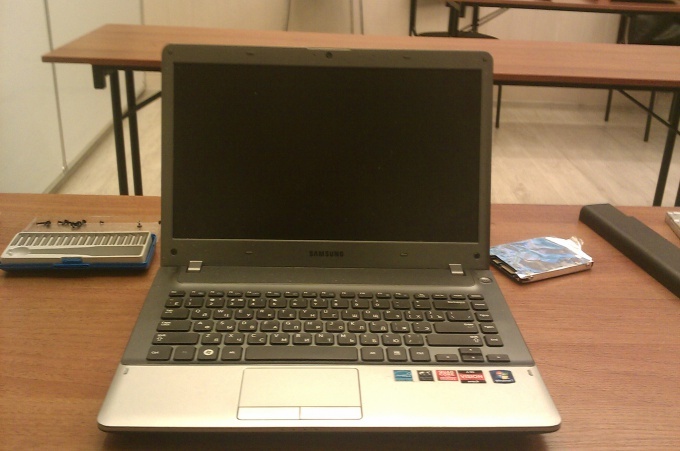 For each model of portable computer will have their own peculiarities. 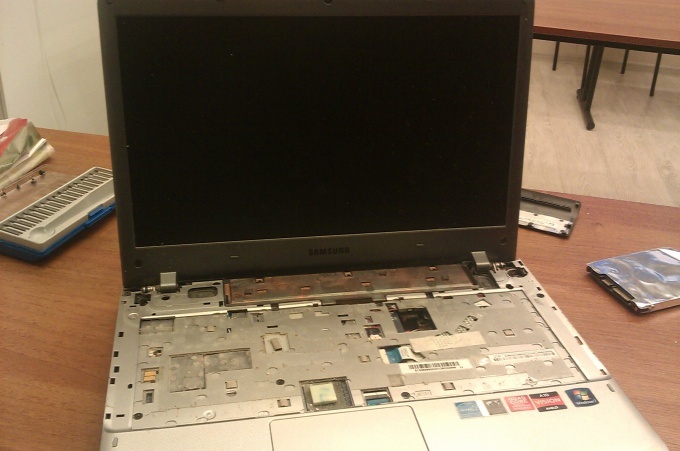 Step-by-step guide to disassembly laptop Samsung NP355V4C. 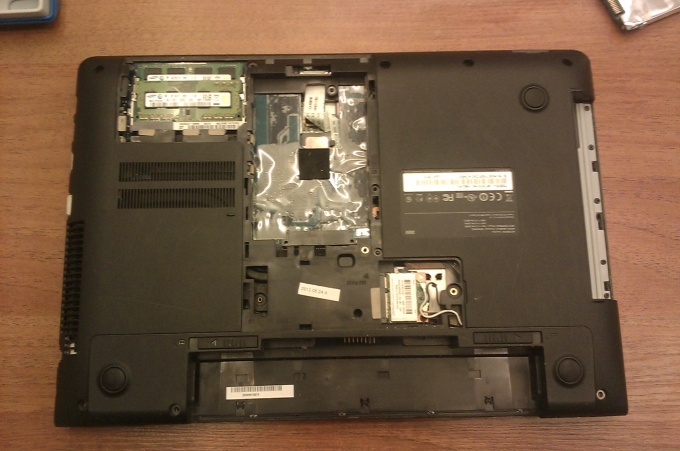 The first step is obvious: take out the battery, Unscrew all the screws on the bottom of the laptop. You can now remove the two caps covering the memory modules and hard disk. Remove hard drive by pulling it in the direction opposite to the connectors. 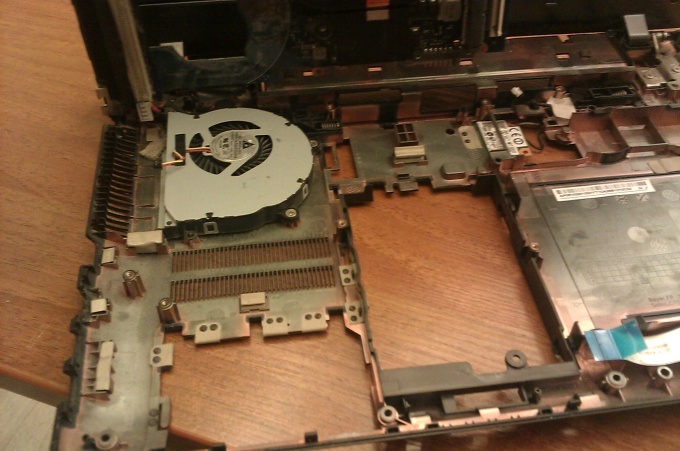 Take out the DVD-ROM drive by unscrewing the single screw retaining it. Unscrew all the screws that were hidden under the covers. 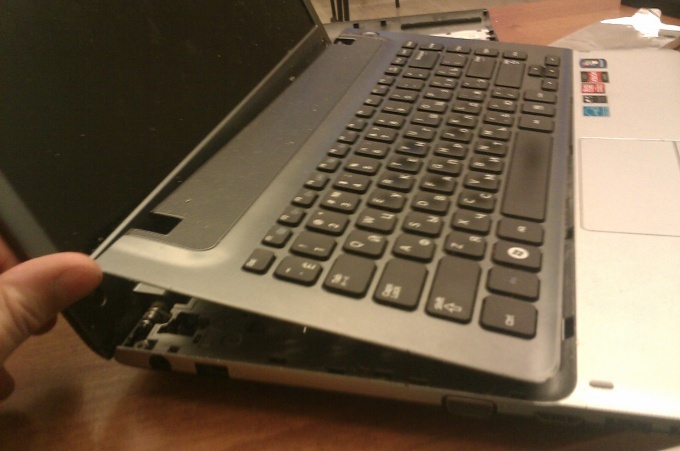 Overturn the laptop. The keypad is attached with plastic latches. Carefully hook the edge of the keyboard (it's better to use nails than a tool to avoid scratching) and start one at a time to unfasten the retainer clip. 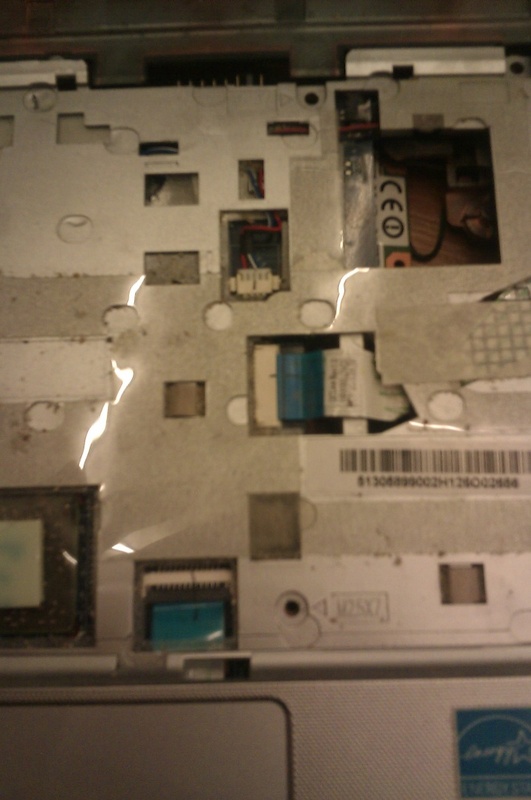 Not much pull since bottom secure the keyboard Flex cable to the motherboard. Turn the laptop. Locate the connector which is the keyboard ribbon cable. It is located just under the WiFi module. Move the module to the side to open up access to the keyboard connector. Raise of the dark level up, then the loop can be freely disconnected. 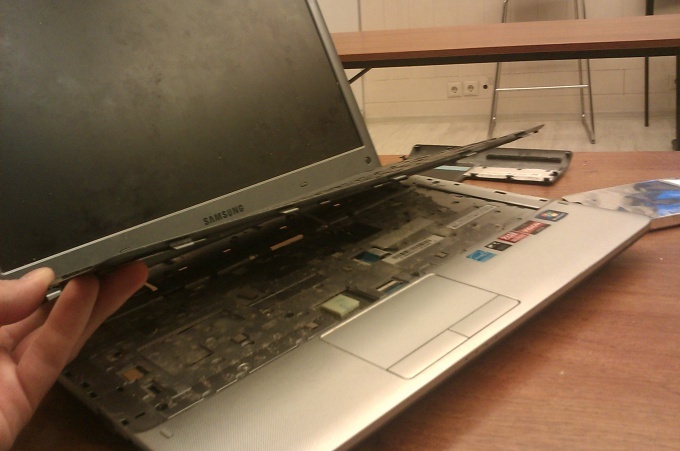 Now you can remove the laptop keyboard Samsung NP355V4C. The next step is to turn off all the plumes that covered a keyboard. Unscrew the screws holding the top cover and remove it. We have opened up a view of the motherboard. It is secured with 7 silver-tone screws at the top. Unscrew them. That's all! 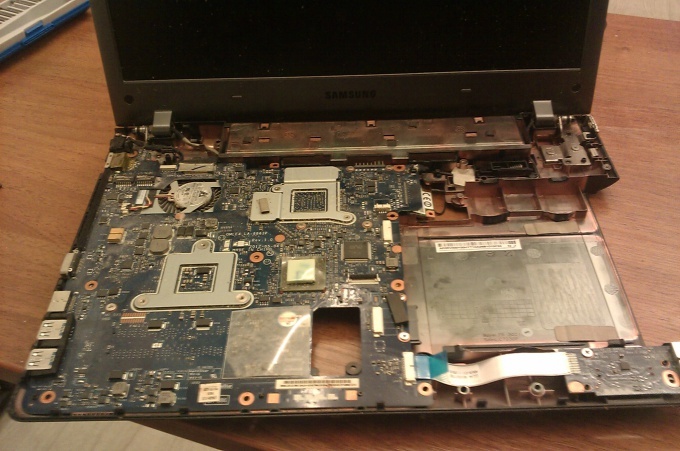 Now You have access to all the insides of the laptop Samsung NP355V4C. Assembled in reverse order. When disconnecting the ribbon cable and power connectors, be especially careful because the connectors are quite fragile, and the wires are thin. And of course, do not forget about safety precautions: avoid humidity and static electricity on the whole process. It removed fairly easily, without effort. So if something is not removed, it means that somewhere there is still a mount. Screws lot, maybe you missed something. Better to check again than to rush and break something. The same applies to the cables and power connectors. Before proceeding to the next step, make sure that you have done what described in the previous.